Durable polypropylene and steel construction. Clear, accurate measuring for professional and DIY. Double-sided blade print, blade lock, automatic blade retraction and belt clip. Dual-marked metric and imperial scales. EC Class I accuracy. Durable polypropylene and steel construction. 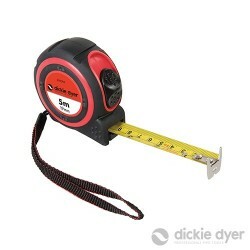 Clear, accurate measuring for professional and DIY. Blade lock, automatic blade retraction and belt clip. Dual-marked metric and imperial scales.